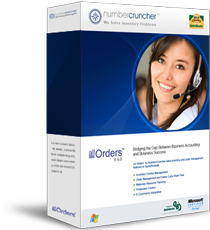 All Orders Inventory Software by NumberCruncher was designed to add inventory and order management features to QuickBooks Pro, Premier and Enterprise 2002 or higher. If you have a manufacturing, wholesale or distribution business and you need to effectively track inventory quantities, production and customer orders, then All Orders by NumberCruncher is the perfect QuickBooks inventory software solution for you. All Orders user licenses are based on concurrent users. First year maintenance is included in the price. Maintenance after the first year is $0. Be sure to read up on the benefits you will receive from your maintenance plan.